On a crazy train. You know how sometimes actors make a big deal about doing their own stunts; Buster Keaton could laugh in their faces. J. – I was so glad to have an opportunity to see this film again. I think it is a laugh-out-loud-funny movie, but before we address the comedic aspects of the film, I’d like to suggest that The General is primarily an action movie. The comedy is certainly inextricably linked with the action (as it pretty much has to be in a silent movie), but The General would be exciting even in the absence of humor. This is a big, blockbuster-style action movie in scale and kineticism. Armies clash, trains crash, daring rescues are made, and thrilling escapes are executed. And above all there is the chase. The planning and forethought that must have gone into those train chases is a remarkable achievement in and of itself. Because they are confined to tracks, trains are tricky things to work with — how can you have an exciting chase when the pursuer can never overtake the pursued? The General demonstrates exactly how awesome that scenario can be. S. – I fully agree that this is an action movie. Outside of the story that was being told I was enjoying the mechanics of the film, spellbound by the action unfolding on screen. Not only were the many stunts performed amusing, you feel very involved in watching how they are choreographed. This dual sense of watching inside and outside the story, almost like a rom-com and a circus act at the same time, just added to the fun for me. The way the trains were used as moving sets was awesome. All of the subsequent films that feature a punch-up atop a moving train should hang their heads in shame, it has already been done and far better than any modern version I have seen. J. – Choreography is definitely the right word to throw down for this film. Everything was so expertly arranged and Keaton himself such a spry, physical presence that all of the action — even the goofiest stuff — was like a dance. Heck, even the trains seemed to be participating in an elaborate ballet of near misses (and collisions for that matter). I like the idea of the trains being treated as moving sets; that’s a particularly apt description of how those scenes are handled. In the coming weeks we’re going to start checking out some Charlie Chaplin films, and Chaplin is also a master of body control and elaborate visual humor, but he lacks the gymnastic daring that Keaton displays throughout The General. What’s even more remarkable is Keaton’s ability to engage in these outlandish events without once trying to oversell the emotion, and he’s able to court the girl without ever appearing sentimental or mawkish (as Chaplin sometimes does). You’d think Keaton’s persistent deadpan would either get tiresome or short-change the humor, but it never does. If anything it makes all of his mad accomplishments that much funnier. He gets more out of shrug than most would with reams of dialogue. 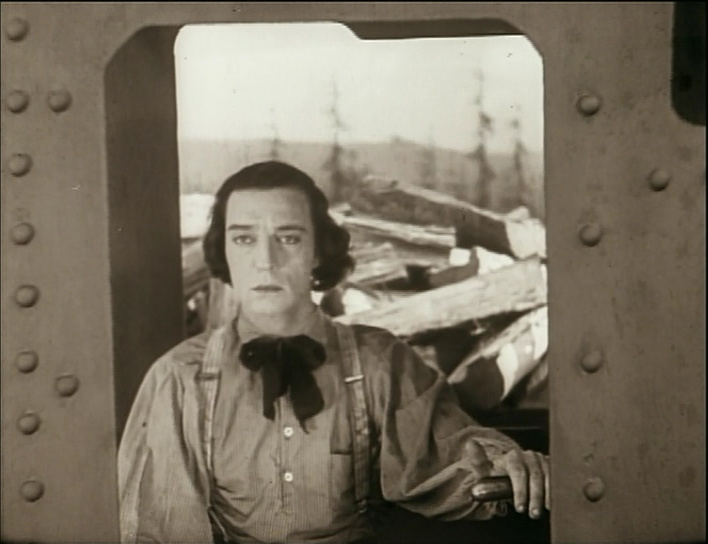 S. – The style of Buster Keaton is a huge factor in the appeal of the film. The way he moves smoothly between feats of the ridiculous and the magnificent without his manner betraying the disconnect adds unexpected sophistication to the character all while being belly-laugh funny. And the narrow range of facial expression that he does display are used to great effect, a slow blink can be far funnier than I would have imagined. I was quite impressed by the scale of the film, much of the footage is shot outdoors with a large crew of extras, plenty of heavy machinery and even an impressive train crash. It must have cost a packet! 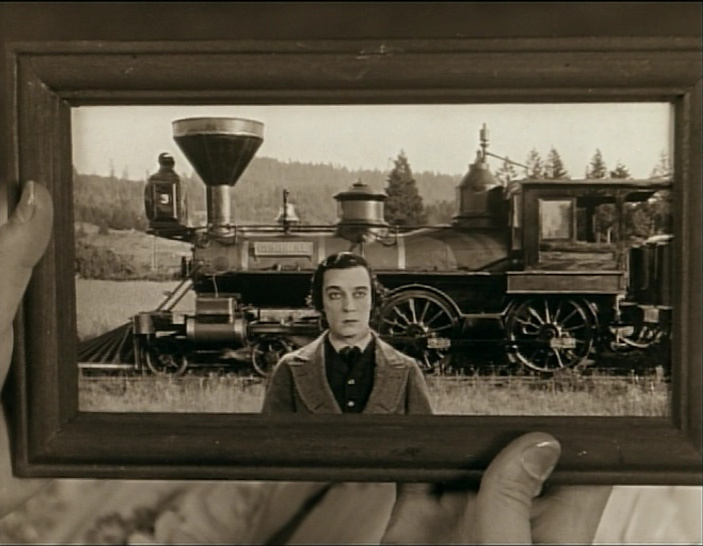 Post-slow blink, Buster Keaton elicits surprise at the events that just befell him. But I’m sure you can see that. J. – From what little I have read, I believe the train crash is the single most expensive shot in the history of silent film; so you are right on about that. Sadly this movie tanked at the box office and really sidelined Keaton’s career. It seems almost impossible to imagine that people didn’t flock to this film. I would have assumed it was a blockbuster. I found the scale of the movie remarkable (and remarkably well choreographed) as well, but I think those BIG, BIG elements of The General are not as interesting as the little gags and moments that add up throughout. The awful series of things that happen to poor Annabelle Lee (Marion Mack) are cumulatively hilarious, as is Keaton’s seemingly equal affection and annoyance with her. And I really like the way the film messes with expectations. The scene where the knocked-out Union officer begins to wake up would have resulted in a drawn out struggle in any other action-oriented film; that he simply gets knocked right back out again is a killer gag even if it makes for a smaller moment. Likewise, the photograph Keaton gives to his sweetheart (see below) is such a small, quiet joke, but it’s hilarious, establishes his character, and enbles a another funny, casually executed gag a few minutes later. More to the point, for all the armies and rushing locomotives, the film never forgets that sometimes it’s just plain funny for somebody to fall down and go boom. Keaton gives a portrait to his sweetheart. Who couldn’t love that face… and that train? S. – I think what makes this movie great is that it furnishes a bold but simple plot with a thousand little interactions that are funny, sweet or silly. It stands in stark contrast to The Cabinet of Dr. Caligari, another silent film we watched recently, where the plot was more complex but the details were missing. A week later I’m still smiling to myself remembering incidents from The General. It is a shame it did not receive the success it deserved when it was first released but thankfully it has not sunk into obscurity, for it is a gem of a film that I look forward to watching again. I hope there is more Buster Keaton on the Sight & Sound list because I think I’m hooked! And lucky you, we’ll soon be watching the 1924 Keaton film Sherlock, Jr. as part of our experiment!